Lagos-based distributed energy provider Rensource has raised US$3.5 million in bridge financing to grow its power-as-a-service renewable energy business. Rensource, founded in 2015, is a provider of predictable energy on-demand in a region hindered by insufficient power infrastructure. Its tiered, subscription-based energy service offers clean, quiet, seamless power, freeing households and businesses from unreliable public energy providers and toxic diesel generators. The US$3.5 million round was led by Amaya Capital Partners, with other key investors including the Omidyar Network and CRE Venture Capital, which Rensource said positions it for profitable growth in the power-as-a-service renewable energy market in West Africa. The funds will be put towards growing the Rensource team, expanding operations into Kano and Abuja, and widening its product base. In addition, it will allow Rensource to launch its B2B-focused “Powered by Rensource” offering, which aims to enable businesses throughout Nigeria to leverage Rensource’s infrastructure to pursue energy independence. Anu Adasolum, general manager of Rensource, said the investment further affirms the growing consensus that renewables-based distributed energy generation – taking power to the people – is the future of Nigeria’s power industry. “Rensource is uniquely placed to lead this charge. We’re excited to welcome Amaya Capital and the Omidyar Network on this journey and are proud to be enabling Nigerians’ power independence,” Adasolum said. Rensource previously raised a US$1.1 million seed round, also funded by CRE Venture Capital, as well as Sissili Limited, among others. 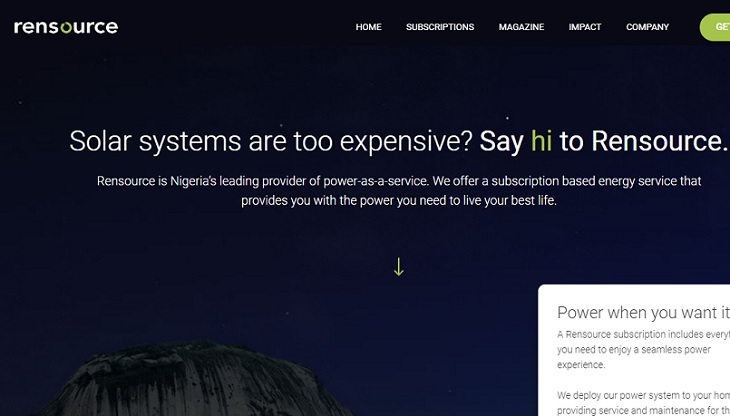 Bola Ogidan, chief revenue officer at Rensource, said each investment the startup receives is an endorsement of its belief that distributed power generation will be a critical element in solving the power problem in Nigeria. “The social benefits and positive ramifications will be something to behold and we at Resource are proud to be playing our part in what could be a true energy revolution,” he said.